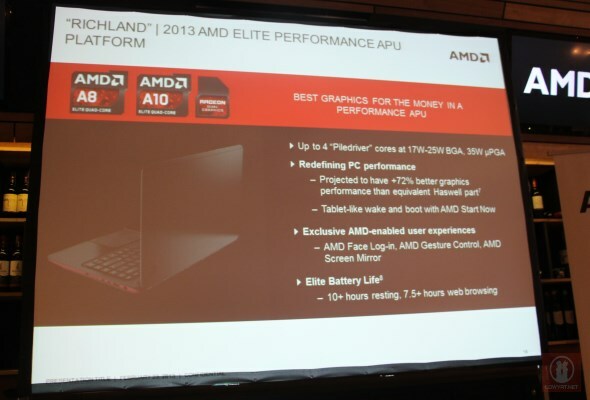 As part of the recently launched AMD mobile APUs line-up for 2013, the Richland-based AMD A8 and A10 mobile APUs are positioned as the flagship models of the family. This is due to their top-of-the-line capability in both computing and graphics with an increase of up to 19-percent in terms of overall performance as compared to the company’s previous generation mobile APUs. According to our sources at AMD Malaysia, consumers should be able to spot these new Richland-based mobile APUs in laptops at retail stores starting from this month onwards and one such example is the new Lenovo G405S. 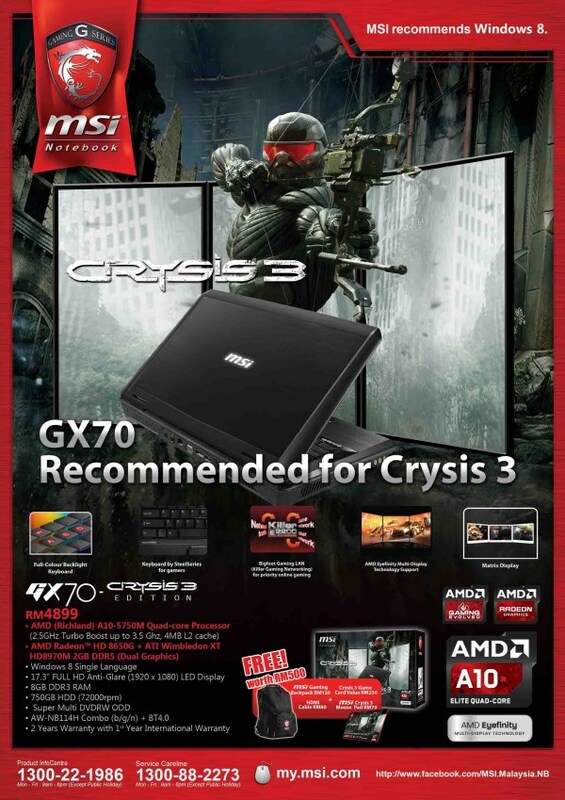 Priced at RM 1699, the G405S is a traditional clamshell non-touch 14-inch Windows 8 laptop that is equipped with the AMD A8-5550M quad-core APU that runs at a base clock speed of 2.1GHz and turbo speed of 3.1GHz. The Lenovo G405S is also equipped with an AMD Radeon HD 8570M discrete graphics with dedicated 2GB DDR3 RAM, together with 4GB DDR3 RAM for the rest of the system and 500GB hard drive. 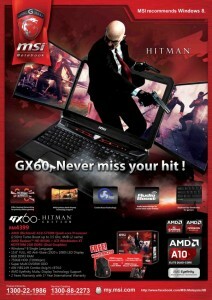 Apart from that, another example of Richland-based laptops that are readily available in Malaysia are the MSI GX60 Hitman Edition and GX70 Crysis 3 Edition gaming laptops which are powered by AMD A10-5750M quad-core APU with 2.5GHz base clock speed and 3.5GHz maximum speed. 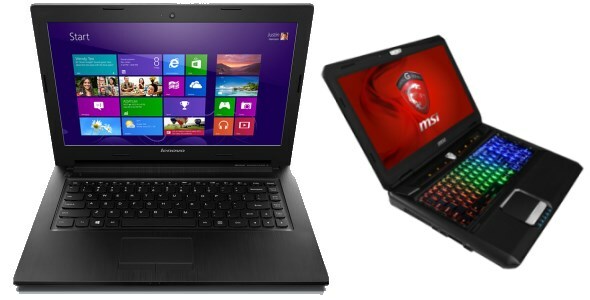 L-R: Lenovo G450S and MSI GX60. 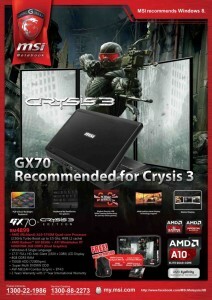 Since they are targeted for users that require high-performance, both of these new MSI gaming laptops are also equipped with high-end AMD Radeon HD discrete graphics, 8GB of RAM and 750GB 7200rpm hard drive. Not to forget, a price tag of RM 4399 and RM 4899 respectively as indicated by the promo posters which we have included right after the jump. More Richland-based notebooks by other OEMs will be made available in the coming weeks as well, so expect them to appear at your favourite retailers soon enough. Click to enlarge them on a new window.